According to Chinese legend, Bo Le (伯樂) was originally the name of a god in charge of the horses of Heaven. He was the master at judging a horse’s qualities just by its appearance. The name was later given to those in the human world who excelled at horse appraisal. During the Spring and Autumn period (770–476 B.C. ), there was a man named Sun Yang (孫陽). He was an expert at evaluating horses, so people called him Bo Le. One day, the king of Chu asked Bo Le to find a swift horse that could run 1,000 li (Chinese miles) a day [a metaphor for swiftness]. Bo went from one state to another to find such a horse, but could not find a swift horse for the king that met that criteria. 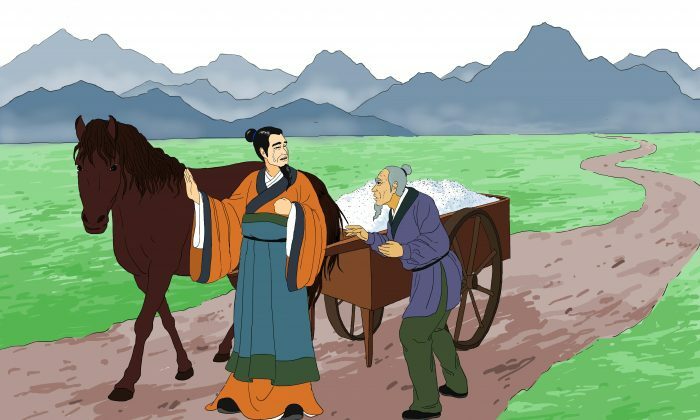 Eventually, in the state of Ji, Bo Le saw a horse pulling a wagon loaded with salt up a steep hill. The horse struggled to draw the heavy wagon. It was sweating all over and its tail drooped tiredly. However, Bo Le saw something special in the horse and approached it. He used his own clothes to wipe the horse down. The horse neighed loudly, with eyes open wide, as if it wanted to tell him something. Bo Le could tell from its neighing that it was a swift horse. Bo Le bought the horse and took it directly to the king of Chu. However, the king, noticing that the horse was quite thin, was skeptical. Bo Le told the king it was indeed a swift horse and it would regain its strength in no less than two weeks if it was well-cared for. The king directed the stableman to take good care of the horse. Just as Bo Le said, the horse soon became very strong. When the king rode the horse, it ran 100 li within minutes. Later, the horse made great contributions on the battlefield, and the king of Chu respected Bo Le even more. This story was recorded in Chapter 7 of “Han Shi Wai Zhuan(1),” a collection of 360 stories and poems from the Western Han (206 B.C.–A.D. 23). Later, the idiom伯樂相馬 (bó lè xiàng mǎ), which literally means Bo Le appraised the horse, evolved from this story. It is used to refer to someone who can recognize special talent in people or offers opportunities for people to showcase their skills. Note: “Han Shi Wai Zhuan (韓詩外傳)” is literally translated as the “Other Commentary of Han Poetry” or the “Alternative Bibliography of Han Poems.” It was written by Han Ying (birth and death unknown), who was a scholar in the early Han Dynasty.